the 1916 Easter Rising was the first major uprising since the end of the 18th century, but it didn’t go well and was quashed within a week. popular opinion of the rebels at the time was not favorable; no one joined the cause and the British were able to quash the uprising entirely. they did produce and sign a proclamation of independence, which the signers knew might likely lead to their executions (which it did). the general post office in the middle of O’Connell Street was the center of the action (though the taking of the Four Courts was crucial as well). there’s a good narrative of events here. the leaders of the uprising were taken into custody at Kilmainham, tried, and promptly sentenced for execution. 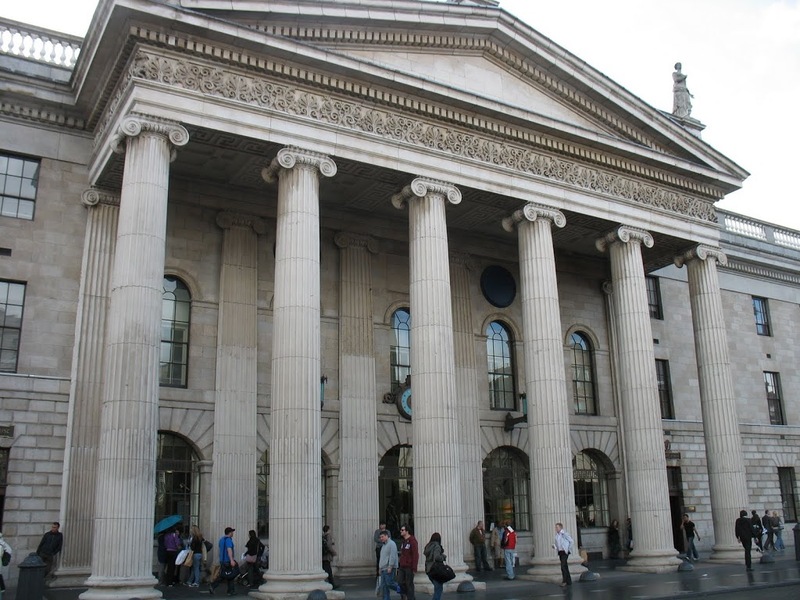 one of the leaders sentenced to death — James Connolly — was wounded during the final battle at the GPO. consequently, he was never held at Kilmainham, but rather transported to a prison hospital, where he was held until the day of execution. a gunshot wound he’d received doing battle with the British became infected and doctors did not give him more than a few days to live. this did not appease the British, who determined that he must still be executed based on the order handed down. on the appointed day (12th May 1916), he was transported from the Royal Hospital by stretcher to the jail. whereas the other thirteen men executed at Kilmainham for their part in the uprising were marched to the far end of the yard, Connolly was in such bad shape that the British decided not to inflict the additional, excruciating pain of carrying him to the far end of the yard. instead, he was tied to a chair — as he could neither stand nor even sit up on his own power — and shot. word of the executions got out and turned the tide of public opinion. despite the best efforts of the British, details made their way into newspapers and other publications. although the executions were carried out in the isolated hard labor yard (which could not be seen from elsewhere in the prison), the priests present to administer last rites were appalled by the treatment of the condemned (and particularly James Connolly) and felt no compunction about sharing the horrors they witnessed. it was these reports that re-cast and illuminated for the general Irish populace the ideals for which the rebels fought and died and, ultimately, which shifted public opinion towards demanding independence. the far end of the yard in the second picture is where all but one of the leaders of the Easter Rising were executed. the final man, James Connolly, was executed on the spot directly to my right as I took this picture.